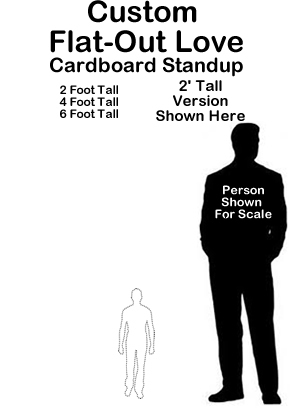 Custom Flat-Out Love Cardboard Cutout Standup Prop - Dino Rentos Studios, INC.
Get your own custom-made cardboard cutout standup prop for your Flat-Out Love book party, display or production! Make a Flat-Out Love prop of your significant other, family member, or yourself! Just submit a high resolution image to sales@dinorentosstudios.com along with your Online Order ID# when placing your order and we will be in touch within 24 business hours with a pre-production art proof of your custom prop.